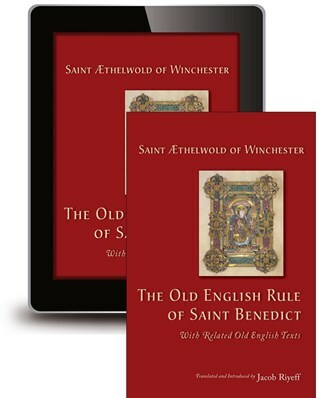 St. Æthelwold (904/909-984), abbot of Abingdon and bishop of Winchester, made the first translation of the Rule of Saint Benedict into English (or, indeed, into any vernacular language) as part of the tenth-century English Benedictine Reform. This movement dramatically affected the trajectory of religious life in early medieval England and influenced the ways in which secular power was conceived and wielded in the kingdom. Æthelwold's translation into Old English reworks Benedict's Latin text through numerous silent additions, omissions, and instances of explanatory material, revealing an Anglo-Saxon ecclesiastical and political reformer intent on making this foundational Latin text more readily accessible to the new monks and nuns of the Reform and to the laity. Presented with related texts composed in Old English, this volume makes Æthelwold's transformation of Benedict's Rule available in Modern English translation for the first time. Jacob Riyeff teaches in the English department at Marquette University in Milwaukee, Wisconsin. Specializing in Old English poetry and medieval monastic culture, he also translates Old English, Middle English, and French poetry and writes original verse. Jacob is a Benedictine oblate of Osage Deanery in Sand Springs, Oklahoma. "The vast corpus of Old English literature captures a fascinating cultural exchange as Latin learning was translated into a Germanic vernacular. For too long, this material has been largely unread outside of linguistic or English departments, and scholars of religious history have been unaware of its contents. Jacob Riyeff's new translation of The Old English Rule of Saint Benedict is part of a new wave of scholarship bringing these treasures to a wider audience. In this work, Riyeff makes accessible a seminal text of the Benedictine Reform translated by its foremost intellect, St. Æthelwold of Winchester. Appendices gather together further Old English witnesses to the context and influence of this text. Riyeff's commendable translation is well introduced and annotated, drawing on the best recent scholarship from both Benedictine studies and Old English. No student of the Anglo-Saxon church should be without this book." "Dr. Riyeff's book performs a valuable service for all who are interested in the medieval reception of Benedict's Rule. Most usefully, Riyeff's fluent translation of the often difficult Old English version of the Rule encloses in angled brackets all of the more substantial additions and alterations that the tenth-century translator, Bishop Æthelwold of Winchester, made to the Latin original. Such marking, combined with Riyeff's lucid commentary, allows readers to appreciate at a glance the many differences, often small but telling, that make Æthelwold's version worth study in its own right." "This terrific book will be a boon both to scholars of the history of Benedictine monasticism and to those who seek to explore the spirituality of St. Æthelwold and his reform. The scholarly apparatus will facilitate deep study of the Old English Rule as well as its affinity with the Latin Rule. The translation, while eloquent, is faithful to Æthelwold's own language and to his intentions for the education of monastics."